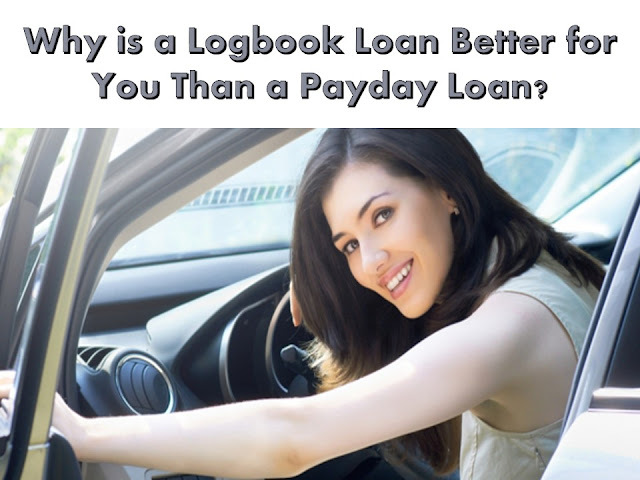 Why is a Logbook Loan Better for You Than a Payday Loan? Home / Finance Tips / Sponsored Post / Why is a Logbook Loan Better for You Than a Payday Loan? When you need money in a hurry, there are plenty of ways to get it. But fast cash usually comes at a cost, which is why you should do some proper research before signing any loan agreement. Both payday and log book loans are popular choices to deliver cash when you need it, but why is a log book loan better for you than a payday loan? Payday loans are a simple way to get a sum of cash quickly, whether to pay for an unexpected repair or expense, or just to see you through until your next payday. Because they’re designed as a short term fix to help you out, the high interest charged could pave the way for more problems in the future. Another way to get a quick loan just as easily, is to apply for a log book loan. Using your car as security on the loan, log book loans are often seen as a more attractive, safer alternative. But just why is a log book loan better than a payday loan? When you apply for any type of loan, don’t get sidetracked with how much you’re able to borrow. It’s essential to look at the long term, bigger picture. And that means seeing how long the loan will take to repay and how much it will cost you overall. Though payday loans are designed to be paid off quickly (usually within 30 days), the APR interest - typically anywhere between 400% and 1500% or more - means you can be paying back a lot more than you initially borrowed. Any other big or unexpected expenses the following month mean you could incur late payment penalties and additional charges which will see your payments increase. With a log book loan, your payments are agreed upfront, as well as the repayment schedule, so you know exactly where you stand before and during your loan. And, because the loan is secured against your vehicle, it means there’s a chance you won’t need to undergo a credit check, unlike many payday loan lenders. All these things make for a safer loan option, giving you peace of mind. As one of the UK’s leading log book loan lenders, Car Cash Point know exactly why a log book loan is better than a payday loan. For a start, they have flexible repayment terms. These are either weekly, fortnightly, four-weekly or monthly to suit your own income making repayments as easy as possible. They also have a low, fixed rate of APR interest of 230.70%. And, there are no hidden charges to worry about. Any penalties you might incur are brought to your attention before you sign, so you always know exactly what you’ll be paying back. Plus, there are no credit checks. So if you’ve struggled with credit in the past or have had any issues, Car Cash Point should still be able to help you. Together with no penalties for making overpayments, or even paying off your loan early, it all adds up to a genuinely low-cost and low impact loan option. So if you’re trying to make up your mind or understand why a log book loan is better than a payday loan, then Car Cash Point can help you. For more information, talk to the Car Cash Point expert advisors today on 0330 057 8650 or visit www.carcashpoint.co.uk to apply online.